I got an Instant Pot last week and have been cooking with it ever since! 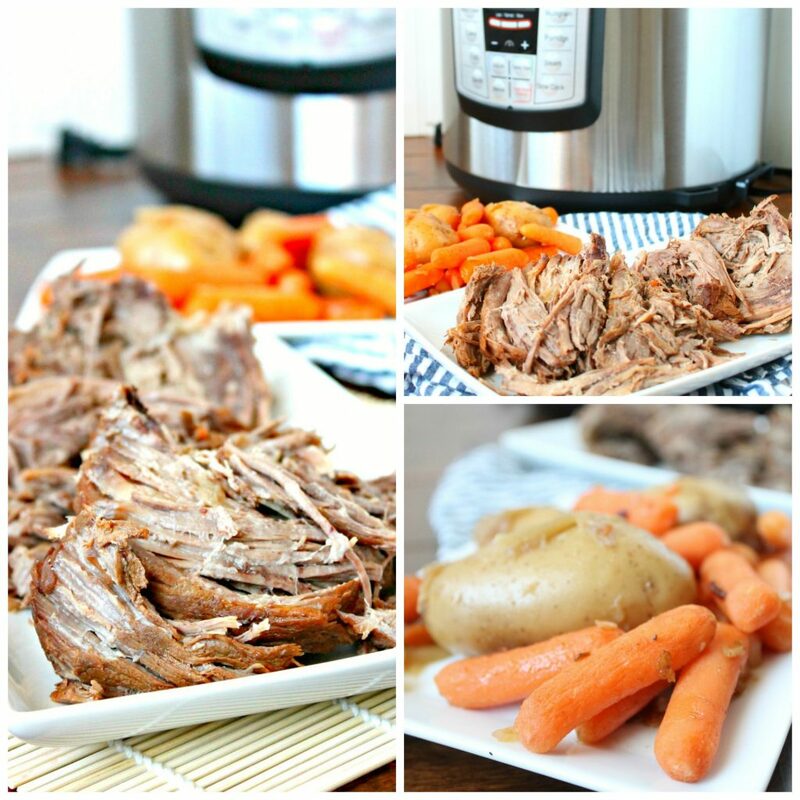 One of my favorite slow cooker recipes is with a Roast so I thought my first recipe needed to be Mama’s Pot Roast! If you have never heard of a Instant Pot – they truly are wonderful! I was a little nervous to try it out because I DO NOT like new things. But my husband surprised me for my birthday so I thought I would try it out. Well, I honestly can say I LOVE IT! Instead of cooking my roast for 8 to 10 hours in the slow cooker, It cooked for 60 minutes and was just as tender! I also threw in some carrots and potatoes so I could have a side dish done all at one time! 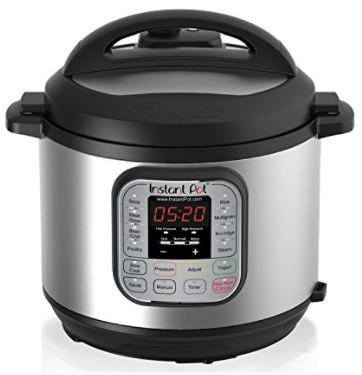 Check out the reviews on the Instant Pot on Amazon and join the 1000’s of people who LOVE it! You can read about it HERE. Season roast with salt and pepper. Select Saute and add oil to the cooking pot. When hot, brown roast on all sides, 8 to 10 minutes. Place into the cooking pot. Add the chopped onions, carrots and potatoes to the pot. Sprinkle on the Lipton Onion Soup Mix and pour on the beef broth. Select High Pressure and set the timer for 80 minutes. When beep sounds, turn off pressure cooker and allow pressure to release naturally for 15 minutes. After 15 minutes, use a quick pressure release to release any remaining pressure. Carefully remove lid. Transfer potatoes carrots and beef to serving dishes. If you want gravy, mix cornstarch and water (3T cornstarch with 3T water) and mix in the juices in the pot. Cook while stirring on Saute until thickened. More Instant Pot Recipes Coming Soon! My in-laws gave me an Instant Pot someone had given them and it honestly sat forgotten in a box in my laundry room for ages. Then I kept seeing Instant Pot recipes pop up on my favorite food blogs and I remembered that box. I wasn't even sure that's what I had, but praise be, it was! I love it! I'm so excited to try this (and the Instant Pot cheesecake recipe I found today!) and am looking forward to your upcoming Instant Pot recipes!!! Update: We had company over last night and I made this. It was so easy and turned out great! I'm so glad you liked it!!!! I got an Instant Pot for Christmas and finally got up the nerve to try it. This was the first recipe I made and it was delicious! Tried this a couple weeks ago and it was amazing. Fall apart roast finally! I'm making it again today! I am excited to try this recipe tonight!! Love my Instant Pot!! Is High Pressure the Manual button? I have a small roast it's like .75lbs. It's only for my husband & I. How long would I cook that with the vegetables in the Instant Pot? I'm a newbie with the Instant Pot.. When u say add the oil n brown both side. .Do I put the oil in and cook it on all sides with the lid on or off?? When do i add the veggies? When browning meat, no top is needed on the pot. After browning your roast, put your veggies over the meat, then add the liquid. I’m going to use this recipe for dinner tomorrow; however, I want to use your recipe for twice baked potatoe casserole as well. Therefore, I’m going to leave out the potatoes in this recipe. How should I alter the ingredients if I leave the potatoes out? Thanks in advance! I have the same recipe for pot roast except my recipe calls for 1 can of cream of mushroom soup to be added with the other ingredients, do I need to alter the recipe by cutting back on the liquid?